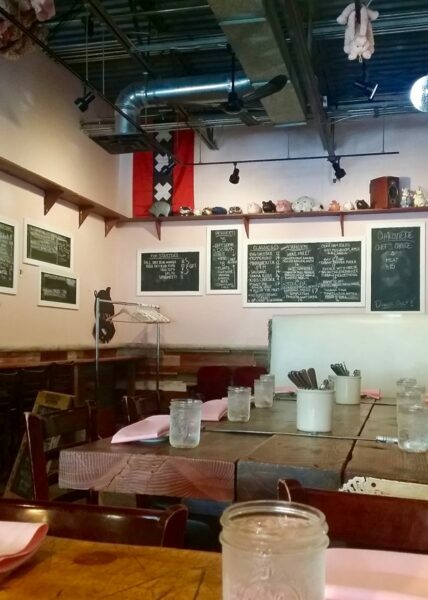 We took an opportunity to eat at Pig Ate My Pizza when we met friends for dinner who were visiting from Texas. We arrived a few minutes early and got a lay of the land. Fun, rustic layout. Large wooden tables all set up with ice waters served in mason jars awaited dinner guests. 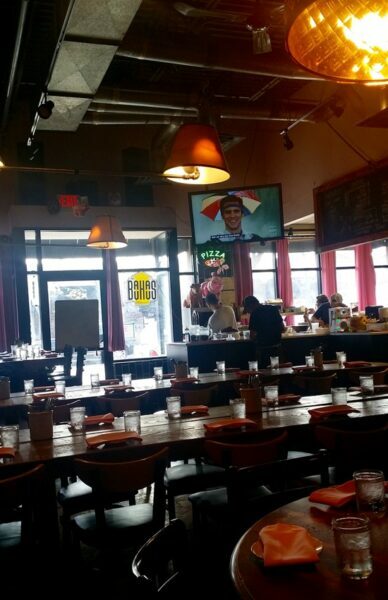 The chalkboard menu was repeated on all the walls so you can easily catch a glimpse from your table. 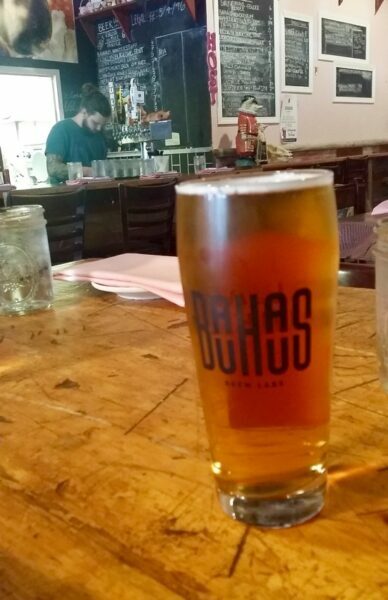 Our server recommended some local beer options that would suit our taste and let us sample a few, too. 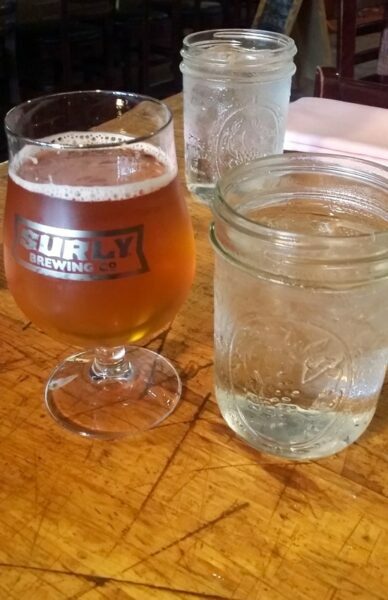 I settled on a Bauhaus Wonderstuff (another brewery tap-room that is on our bucket list to visit)and Dusty had a Surly. 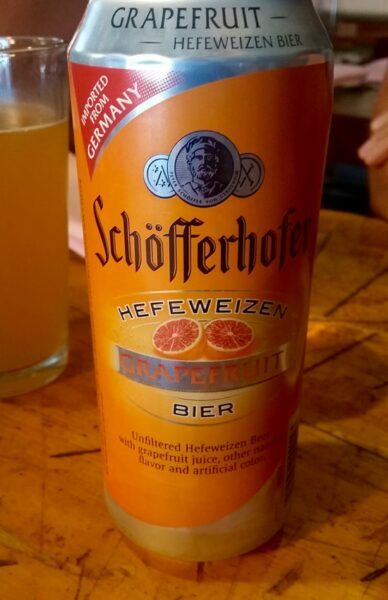 Our friend, Kelly turned us on to one of his favorite beers a Grapefruit Hefeweizen by Schofferhofer. We used the product finder on the website to find it locally. Our refrigerator is going to be stocked with that this summer. Our only other experience with Grapefruit beer is a Grapefruit Shandy by Leienenkugel’s and it is OK but this Hefe Grapefruit is great!! Dusty and I have been plant-based since January. We stick to that plan as much as possible when dining out. We were happy when our waiter told us that there were vegan options for us! 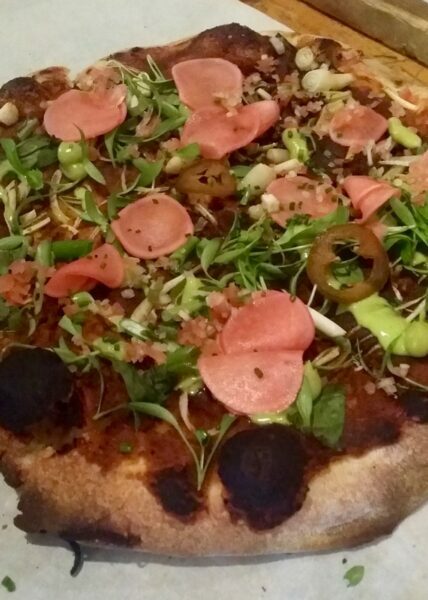 The pizza crust is whole wheat and we switched out the sauce to be mole which is prepared vegan. Also loved that he mentioned there’d be butter on the crust and I could leave it off if I wanted. Prior to our friends arriving at dinner, we chatted up our waiter and asked for vegan options. He mentioned that the Mole would be a good option. 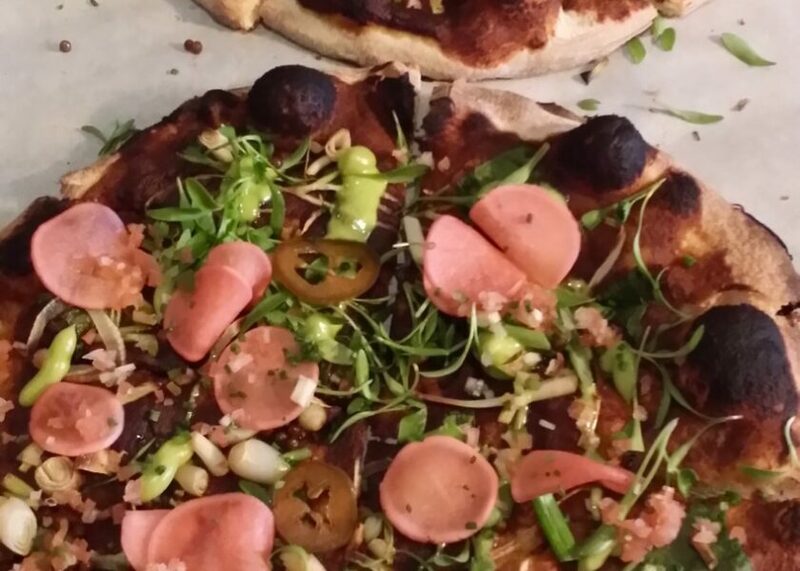 I ordered the Holy Mole without the chicken (Mole, avocado, pickled radish, nuts & chicken). It was so good. Tangy with the nuttiness of the avocado and a bit of heat with the mole sauce. Super Yum. Dusty ordered the Ramp It Up without the bacon (ramps, onion, morel mushrooms & bacon). Dusty really enjoyed his pizza as well. We are really digging the pickled radishes lately. Might have to try to make those too. If you are looking to enjoy a meatless meal, don’t hesitate to modify something on the regular menu! As an aside, the mole sauce was really good and we are looking to try making this at home. Here is a great-looking recipe that I plan to try sometime. 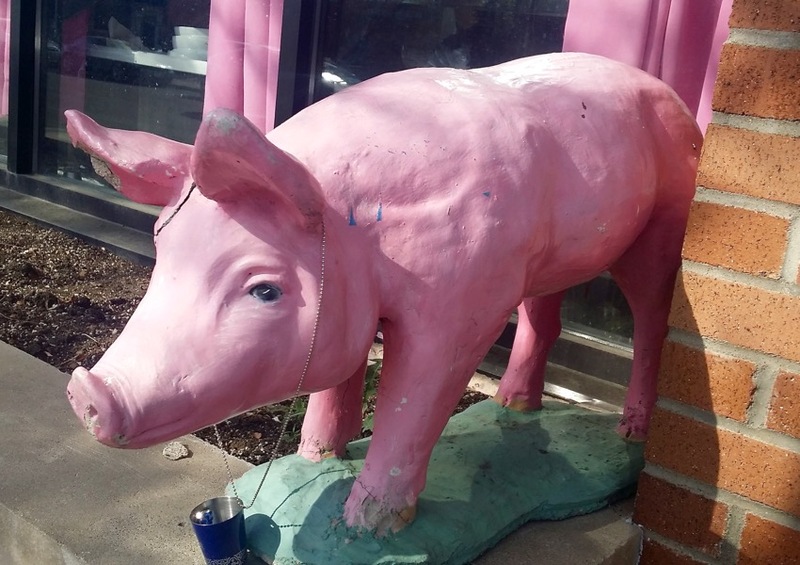 We’re really glad we had a chance to hit up Pig Ate My Pizza and decided we’d like to head back to Robbinsdale for a little day trip. It’s located in a cute little area with other cute little shops and a brewery that we saw nearby as well. Hey, we’re Kelly & Dusty and are plant-based foodies, dining, drinking & discovering Minnesota and its neighbors.